Three members of Age of Nefilim: Josh "J" Rodriguez, Traci Barringer and Matt Lefebvre. I t took nearly a dozen years for Age of Nefilim to make a proper album. Sure, they'd recorded here and there, but it never quite captured what the band's composer and lead guitarist Matt Lefebvre was going for. 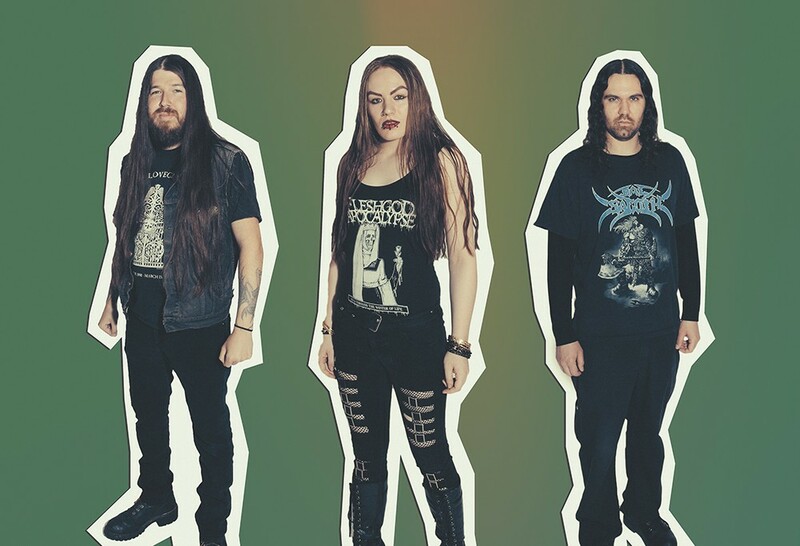 But last November the band finally released Cataclysm in the Land of the Watchers, a razor-sharp production that has impressed the band's black metal colleagues while also revealing an accessible side that is likely to cross over to new fans. It was a serious effort, Lefebvre says, with engineer Anthony Stalker weaving together as many as 100 tracks on certain songs. "We've had a few other recordings, but this is the first that I can say I'm truly happy with," says Lefebvre of the album, which ranges from spooky soundscapes to surging, sludgy metal cuts featuring growling vocals. All the while, the symphonic element of the band shines through, mostly through Traci Barringer's complex keyboard parts. Last November, Age of Nefilim took their symphonic interests a step further when they paired with the Spokane Falls Community College symphony and choir for a show and live recording. Despite his guitar virtuosity, Lefebvre had never taken a music class in his life, so the experience was a crash course at times. "I had only a few months to learn everything I could about arranging, the different ranges of all the instruments, notation, and so much more," he says. The result was one of the most unexpected and ambitious projects to come out of the local music scene in recent years. For Lefebvre, it was a chance for Spokane's musical community to see the possibilities available to them. "It was such a rewarding experience, musically. It was nice to be considered part of the musical collective elite, even for a brief period, with some of the players, where we'd otherwise be ignored because we wore metal shirts," says bassist Kevin George. While it was a massive undertaking, Lefebvre and company think they could do something like this again. Maybe even take it a step further. "I would love to do something on an even grander scale, incorporating some sort of visual performance as well," says Lefebvre. Over the past year the band has changed its lineup, adding George and drummer Devon Jensen. Lefebvre sees the band's sound evolving along with the new lineup. Influenced heavily by video game soundtracks, Lefebvre is also looking at other unexpected influences to process through a black metal spectrum. "Lately I've been very interested in trying to take musical influence from other time eras and cultures and make them metal," he says. With the lineup changes, a solid full-length record that captures the band's innovative nature and the symphony collaboration in the books, Age of Nefilim finds itself in a good spot, energized for its next decade (or more) of pushing the boundaries of heavy metal. Announcing the Volume 2017 lineup; tickets on sale now!